I’ve been thinking it’s time to let you know the products that are on my radar right now and that I’ll be looking to add to my collection given half a chance! Here’s my Weekend Wishlist! When the sun is out I reach for products that give me that golden look. This Molten Metals Nail Paint comes in four chrome effect shades with a mirror-shine foil finish. Just £4.00 here. You know that I’m a sucker for cure packaging and this is so cute as well as bein a really handy way to carry around a higlighter. 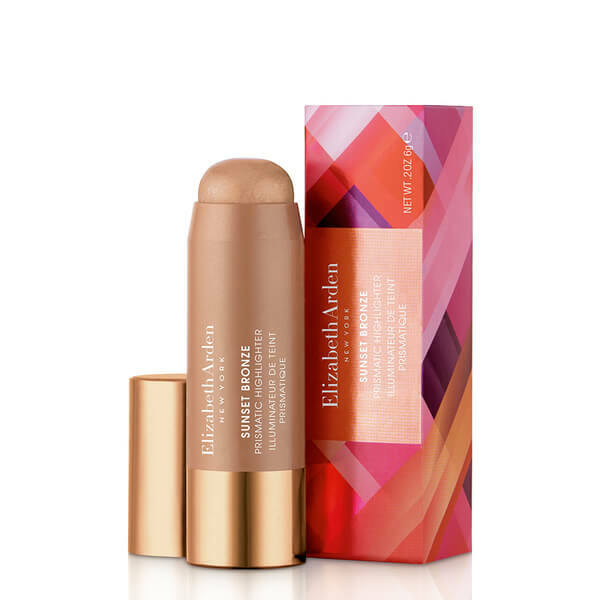 Elizabeth Arden’s Sunset Bronze Prismatic Highlighter is fortified with light-reflecting, mica-based pearls and infused with a blend of Aloe Vera, Zinc PCA and Vitamin E. It’s £25.00 here. The sun can only make my hair need more moisture and I’m intrigued by this Manuka Doctor ApiRevive Restorative Hair Mask – a rich and conditioning treatment that promises to replenish lost moisture and add nourishment to revitalize damaged hair. it contains manuka honey, manuka oil and abyssinian oil for intense nourishment, volume and shine . It costs £19.99 here. This one is way out of my reach, but that’s what wish lists are for.This is the one I imagine wearing on a private yacht looking out on azure seas. It’s Soleil Blanc from Tom Ford. It’s described as unexpected, sultry and addictive. A floral, seductive fragrance that exudes luxuty. It’s £145 here. This is Caudalie’s ultimate anti-ageing eye care. I’ve had more than my fair share of late nights recently and this luxurious cream offers instantly transformed eyes. Clearly I need it! They promise that fine lines, dark circles and puffiness fade away and the eye area is brightened. Not only that it’s perfect for the lip contour area as well. It contains Resveratrol to lift and firm, Viniferine to correct dark spots and brighten, and anti-oxidant rich grape-seed Polyphenols. All of this magic comes priced £49 here. So what do you think? Have you tried any of these? Would you like to? I’ll be sure to tell you if I succumb to buying any of these when pay day comes around. Previous postGet set for summer with this Strand On Beauty giveaway with Ultrasun! That E.Arden highlighter looks mighty fine (whole collection is really nice & I wouldn’t mind lipgloss with this highlighter). Caudalie eye cream-I need tester for that.